When I was very young, I lived with my parents and three siblings in a Victorian terraced house. It was pretty much un-modernized: 2 bedrooms, (a third room upstairs converted to a bathroom with bath and basin but no toilet: that was outside) 2 reception rooms, and a very small kitchen with just one storage cupboard on the wall. I had known for certain for a couple of years before this incident that the house was haunted. 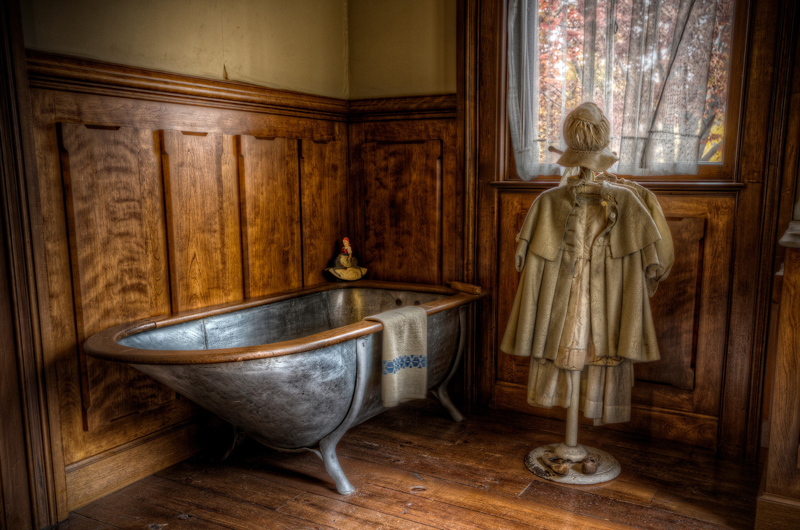 I suppose it was what you would call a residual haunting: every night at 11:00 pm we would hear the distinctive sound of the door at the bottom of the stairs opening and closing, then footsteps coming up the stairs, along the hallway, and into the bathroom where we would hear water running into the basin. I had stopped being afraid of this after my grandmother explained that this was just the old lady who lived there before we did getting ready to go to bed, and she really didn’t even know we were there. It was just the house remembering. However, this one particular night I was having one of my frequent bouts of insomnia and was sitting just inside the door to the bedroom I shared with the siblings (all younger than me, and fast asleep). I had been trying to look out for the old lady to find out whether I could see her, but that time had passed with just the usual sounds, and I was actually just listening to the voices of my parents downstairs, and the sounds from the TV. After a little, I realized that I was actually cold, and had goose bumps all over my arms and legs. Little-by-little a feeling of absolute dread started to overcome me. I was a pretty rational child, even at 5-6 years old, and figured that I was probably worried about being found out of my bed by the parents, both of whom could be very violent at times. But as I curled up to try to warm myself I looked down into the bathroom at the end of the hall and saw what I thought was maybe a dust-bunny swirling around the floor. It took me a little to realize that 1) there was no draft, let alone one that was swirling in circles, then changing direction to move this thing back and forth up to the step in the doorway; and 2) the thing I was looking at was probably about 5-6 inches tall and spinning, like a miniature tornado. I was fascinated, but at the same time, could feel the awareness and malice that it was broadcasting. I really felt that if it wanted to, it could make its way up over that step and down the hallway to me, and that if it did, it would harm me. I was absolutely frozen with terror. It “charged” the doorway over and over, retreating slowly, then rushing again, but totally silent… just a misty grey mass that grew and shrank as it moved. It actually seemed to be taunting me. the more afraid I became, the faster and more frequently it charged. I don’t know how long I sat there. I only barely remember the parents finding me still there when they came upstairs in the early hours of the morning. I was, according to them, dazed and mumbling, as well as blue with cold (in July…). They assumed I had been sleepwalking, and put me back to bed. I didn’t sleep that night, and only for a couple of hours for the next few nights. I refused to even walk past the doorway to that bathroom after dark. I have had other encounters since that have scared me, but that one… I still have no idea what it was, or what it wanted, other than to terrify and harm an already traumatized little girl. 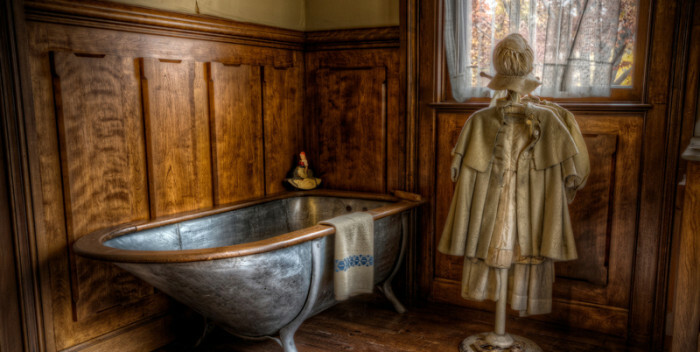 We had a residual haunting in our house when I was a child ( around 6 yrs old) every night (not sure of the time exactly, but late, when everyone was in bed) we would hear the ding of a small bell, and then what sounded like several ppl cleaning the kitchen. Thank heavens I never SAW any spectres though! That woulda been too scary for me! I was already confused enough by just the sounds. (So amazing how some places can remember & record the past like that huh?!) Spooky, yet fascinating as well!